The Reid Harris Papers related to the Coastal Marshlands Protection Act are now open for research at the Russell Library. Reid Walker Harris was born July 6, 1930 in Brunswick, Georgia. He earned a bachelor’s degree in political science at the University of North Carolina at Chapel Hill in 1952, graduated from the U.S. Army Russian Language School at the Presidio, and earned his law degree from Emory University in 1958. Harris was elected to the Georgia House of Representatives in 1964 and served for six years. During this time he was the principal author of several laws concerning conservation of the coastlands, including the Georgia Surface Mining Act and the Coastal Marshland Protection Act. Harris served as head of the environmental section of Governor Jimmy Carter’s Goals for Georgia program and later as chairman of the governor’s State Environmental Council. Reid Harris is retired and lives on St. Simons Island. 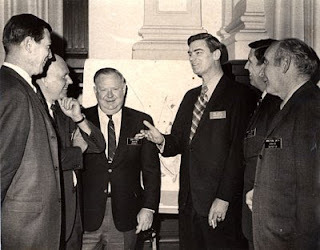 The papers consist of scrapbooks, publications, press releases, clippings, correspondence, photographs, and draft legislation related to Reid Harris' involvement in the passing of the Coastal Marshlands Protection Act of 1970. Also included is a publication by Harris titled, “And the Coastlands Wait” (2008) and his acceptance speech for the 2009 Rock Howard Award. An oral history interview conducted with Reid Harris may be viewed at the Reflections of Georgia Politics Oral History Collection. The Russell Library is open for research from 8:30 am – 4:30 pm, Monday through Friday. For further information on the Reid Harris Papers related to the Coastal Marshlands Protection Act, please contact russlib@uga.edu or call (706) 542-5788.